This imperial Oatmeal stout is brewed with one of the world’s most expensive coffees, made from droppings of weasel-like civet cats. The fussy Southeast Asian animals only eat the best and ripest coffee berries.Enzymes in their digestive system help to break down the bean. Workers collect the bean-containing droppings for Civet or Weasel Coffee. The exceedingly rare Civet Coffee has a strong taste and an even stronger aroma. 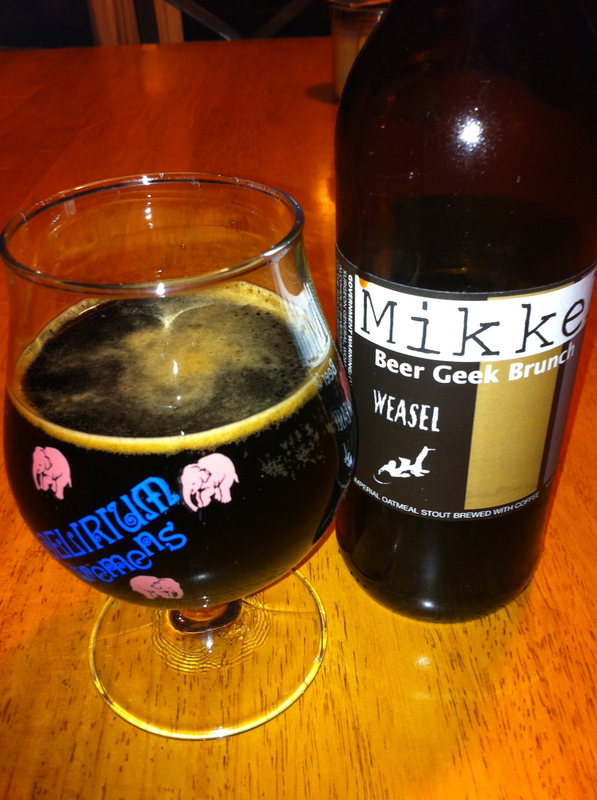 Weasel pours a thick and ruddy deep black color. Tiny bubbles can be seen along the side of the glass, but the middle is pure darkness. The head starts off as a coffee-like head (shocker) before fading to a star-shaped film. Just like a fresh ground bag of coffee beans the nose is very acidic and sweet. Behind that notes of raspberry, cordial cherries and sherry appears. Once the beer is allowed to open up the stout comes more forward with baker’s chocolate and vanilla wafers. Rum was also detected, but definitely not expected. As it warmed up a faint rubbing alcohol like smell arose. The taste is exactly what you would expect: roasty dark chocolate with coffee in full force. There is noticeable booziness that comes toward the end with some toasted oat flavors. It leaves with a sting that is not unlike a glass of bourbon. The alcohol becomes more prominent as the beer mellows out and warms up. Mouthfeel is creamy and thick at first, but that doesn’t prevent it from going down smooth. There is a drying at the end that leaves a dark chocolate like residue in your mouth. 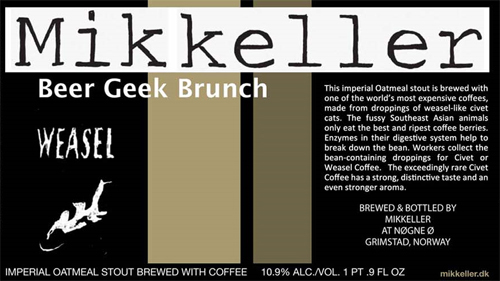 The “Beer Geek Breakfast/Brunch” series has given birth to some of the better stouts on the market today and Beer Geek Brunch Weasel is no exception. But I will warn you that this beer is definitely a sipper, and one that should probably be shared. The flavor profile was constantly changing the entire time I was drinking, leaving me excited to see what each drink would bring. Mikkeller has once again created a beer that would go great with a hearty stack of pancakes or a sizzling side of bacon and one day I want to crack one of these open first thing in the morning and have a true Beer Geek Breakfast.